“Whereas the Bank of Japan veers between influences of the seventeenth, eighteenth, and its own [19th] centuries, the final work of Tatsuno [Kingo]’s to be discussed was less diffident. Ranking in sheer confidence with Tokyo Station, about which, however, nothing need be said except that its facade must be preserved as both a record of Tatsuno’s period style and an element of townscape, the enormous circus of the National Sumo Arena was put up by him in 1909 to hold 13,000 spectators. 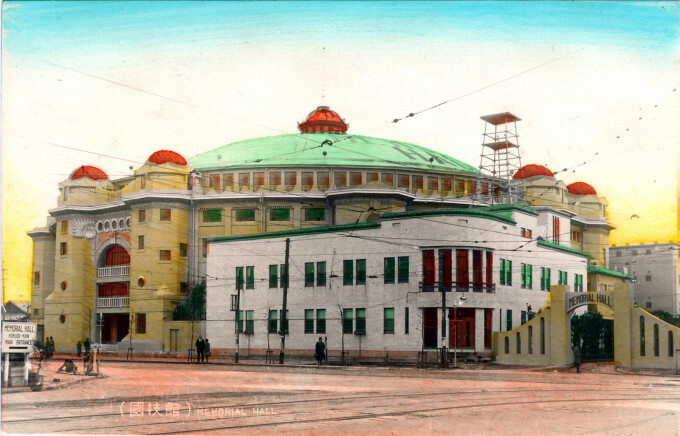 “Here was the most splendid stadium ring of its kind in the Far East, consisting of a vast, centrally glazed, steel-ribbed canopy roof. The facade was composed of multitiered arcades punctuated by stout domed and mansarded turrets providing stairs to the galleries. The membranelike saucer dome of the wrestling hall, which roofed this shrine to the national sport, appeared less than two decades after [Josiah] Conder’s conventional cast-iron dome for the Russian-designed Orthodox cathedral in Tokyo. Kokugikan (National Sport Hall) as originally completed in 1909, and Sumo stable masters. 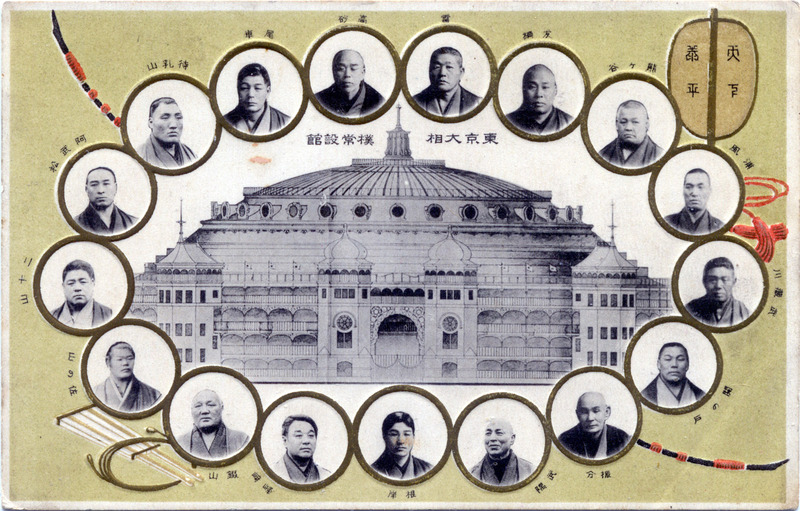 “Following Japan’s victories in the Sino-Japanese and Russo-Japanese wars, one of the most significant changes occurred with the building of sumo’s first permanent stadium in 1909. “One of the elders in sumo, inspired by the poem Emi Suiin’s essay titled ‘Sumo is the National Skill of Japan’ (Sumo wa Nippon no Koku nari), argued that the new building should be called the ‘Kokugikan’ (Hall of the National Sport). His suggestion was accepted and sumo’s new label as the ‘national sport/skill’ gained increasing importance and prominence as the country became increasingly nationalistic. Kokugikan,, c. 1930, after post-earthquake reconstruction. “Kokugi-kan wrestling hall from Ryogoku Bridge”, Tokyo, c. 1935. 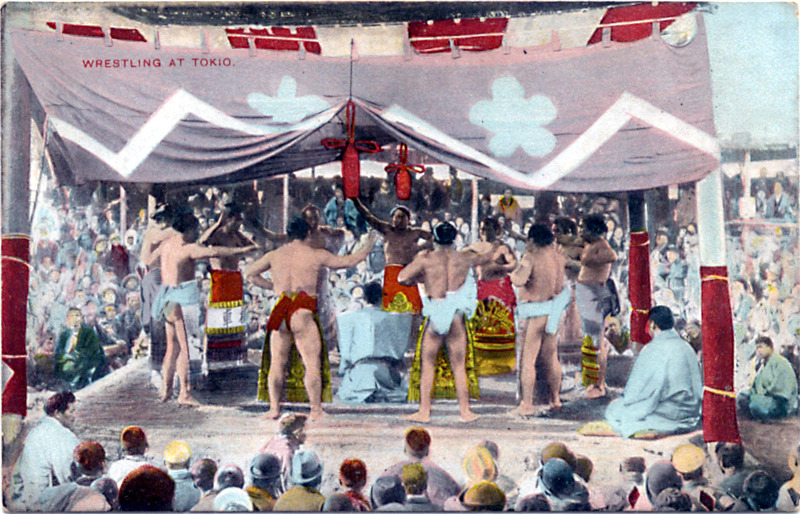 “Common venues for sumo in the early Edo days were the Eiko-in Temple in Ryogoku and Asakusa Kuramae Hachiman Shrine, both located in the old entertainment quarters of the city. The largest of the outdoor arenas could hold more than three thousand people, a sizable number at the time but too small to satisfy the growing legions of fans. 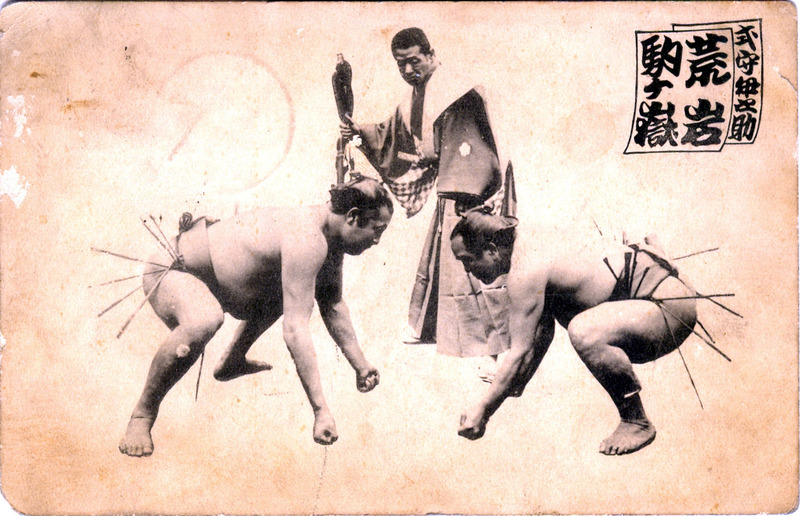 “Wrestling at Tokio”, c. 1910. Sumo wrestler Sotogahama Yataro, c. 1925, who wrestled under that name from 1922-1934. 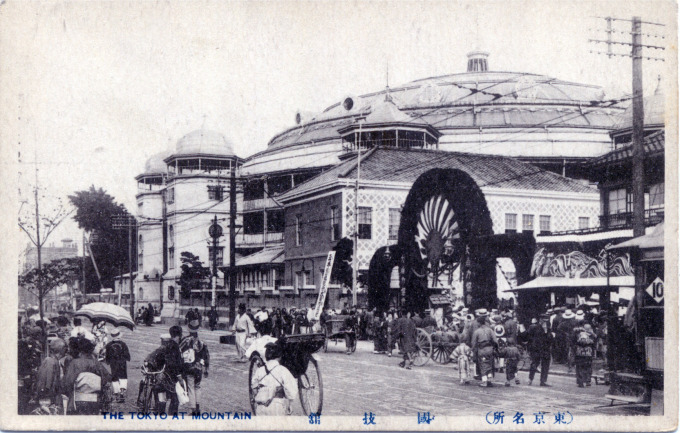 In 1909 the first permanent sumo hall, Kokugikan [national sport hall], was completed on land north of Ryogoku Station next to Eko-in Jinja [shrine] and, until the aftermath of World War II, sumo tournaments in Tokyo took place under its domed roof. 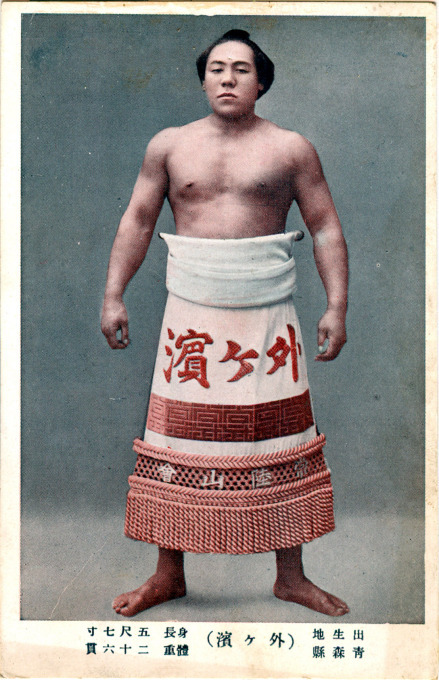 Legend has it a champion wrestler, Umegatani Totaro, helped raise funds for the building of Kokugikan. When asked by a potential sponsor what collateral he had to back the stadium’s construction, Umegatani simply flexed his muscles. He sealed the deal. The first Kokugikan was irreparably damaged by fire in 1917 and completely rebuilt by 1920 (with the Tokyo tournaments held in the meantime at Yasukuni Shrine) only to be severely damaged in the 1923 Great Kanto earthquake. 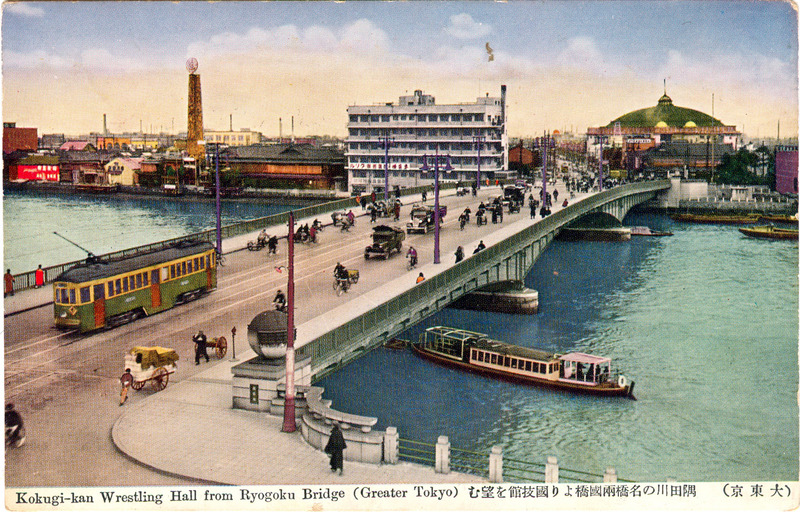 Repaired again, this second Kokugikan survived even the firebombings of World War II until torn down in 1954. A second Kokugikan was completed at nearby Kuramae in 1954. During the Occupation of Japan (1945-1952), SCAP saw sumo as less threatening than other martial arts, and allowed a tournament there in November 1945. One more tournament was held at Kokugikan in November 1946, but tournaments were thereafter held on the grounds of the Meiji Shrine until 1954. 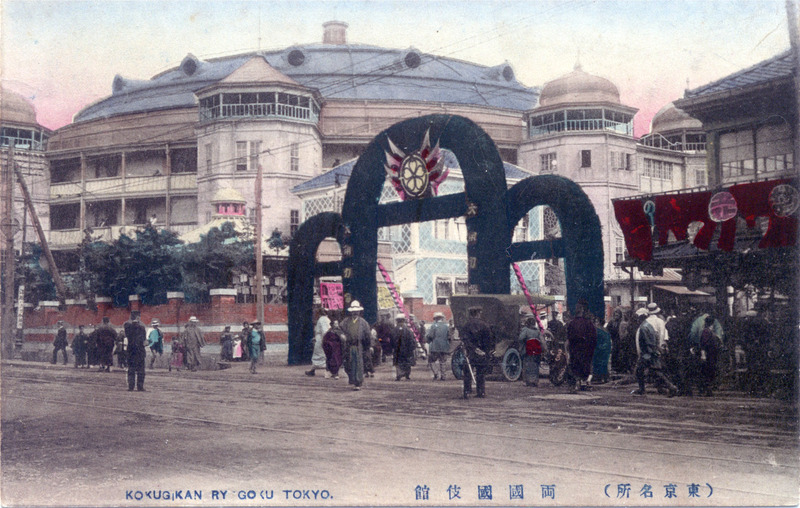 The Occupation forces subsequently took over Kokugikan, however, and turned it partially into a skating rink and an events center they called ‘Memorial Hall’. 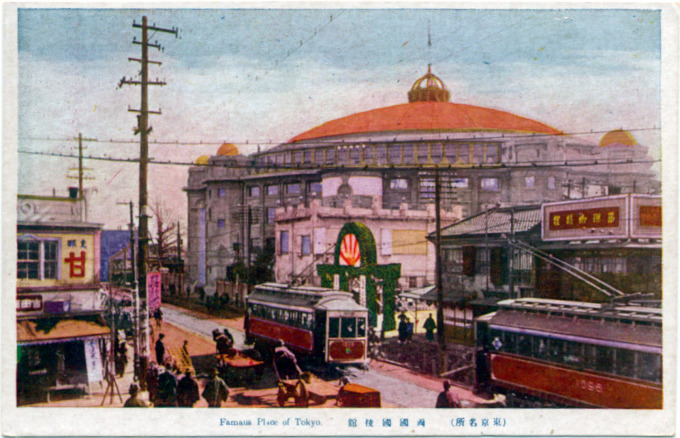 Kokugikan, “Memorial Hall”, c. 1946, when the arena was used as an events center by occupation forces during the Occupation of Japan.